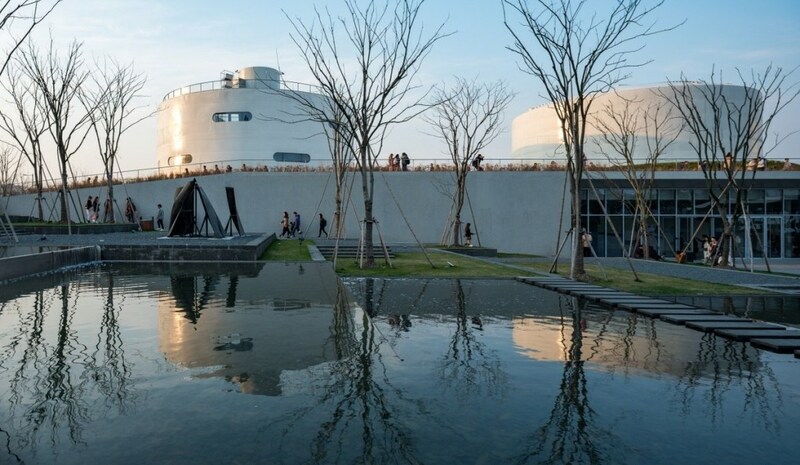 In Shanghai, China, OPEN Architecture‘s latest project, TANK Shanghai, opened to the public on March 23, 2019. 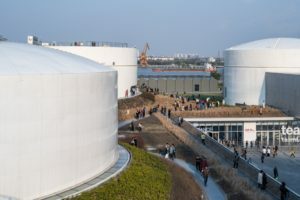 Located in Shanghai’s West Bund, the project revitalizes the site of an abandoned airport, transforming it into a vibrant urban art park woven around five decommissioned oil tanks. The fuel tanks before being repurposed. OPEN’s design reinvents these industrial relics as galleries and other spaces for contemporary art and culture. It has been featured in the 2018 Arts Preview of The New York Times, and listed as one of the most anticipated art museums by a number of influential worldwide art and architectural media. Opening with the art center are three inaugural exhibitions: a group show of Chinese contemporary artists, Under Construction, a solo show of Argentinian artist Adrián Villar Rojas, and the first Shanghai show of the Japanese art collective TeamLab: Universe of Water Particles in the Tank. This project is a story about how industrial relics can be reincarnated through art into a new phase of urban revitalization. 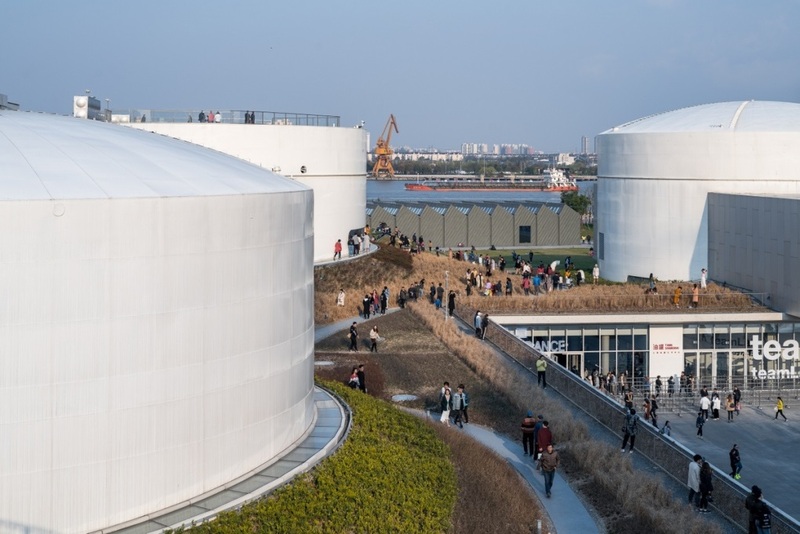 A group of decommissioned oil tanks, a pool for fire-fighting, and the site they sit on—previously Longhua Airport on a prime stretch of the Huangpu River—are preserved and regenerated as an urban park. The tanks have been turned from containers of oil to containers of art and life. While paying tribute to the site’s industrial past, the new art park aims to create new urban life by reestablishing the links among art, nature and the city. OPEN’s design for the project is composed of several distinctive parts: Five oil tanks along with the connecting Super-Surface, Urban Forest, the Plazas and the Project Space. A metamorphic “Super-Surface” is created to form a new ground while connecting all the tanks from underneath. On the surface, it is an expansive landscaped sculptural garden; below the surface, various public programs and exhibition spaces seamlessly connect 5 preserved oil tanks together. Two of the tanks will be transformed into art galleries. One will contain a white cube inside to best adapt to different curatorial needs, especially for delicate canvas works. The other will remain almost completely intact to preserve its bold industrial features, which will be used as a special space for large scale artworks and installations. 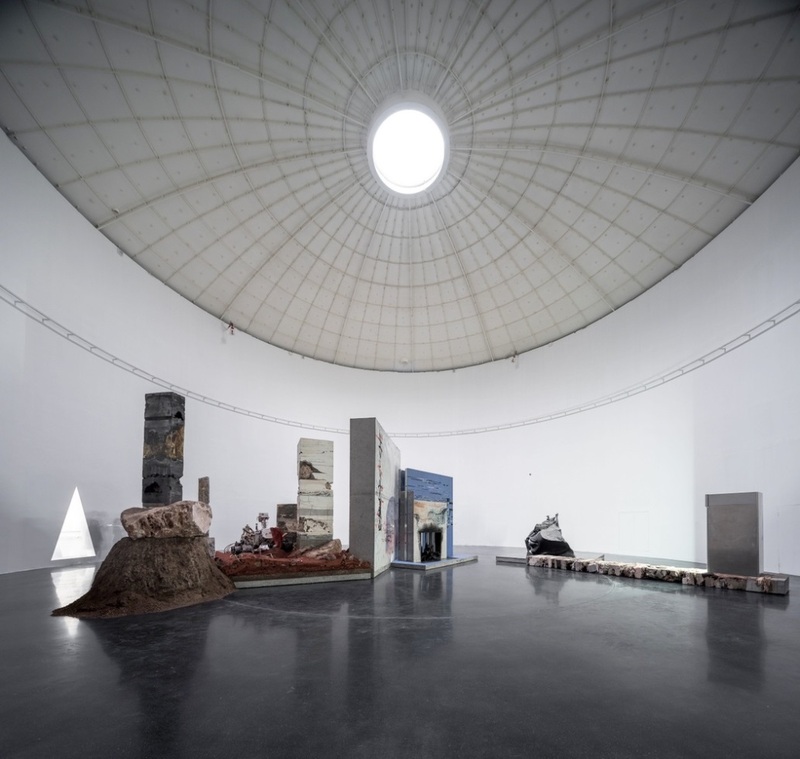 The other three tanks will be renovated as multi-functional exhibition, leisure and activity spaces. An newly-planted urban forest stretches over the entire length of the site. This will be a precious piece of urban nature, hopefully restoring the ecology by attracting birds and squirrels to return. Art works and preserved industrial machines will be scattered in the landscape. In between the Super-Surface and Urban Forest are two plazas: the Urban Plaza and the Event Plaza. Measuring 55 meters square in plan, the Urban Plaza can host large ceremonies and festival events. The embedded misting devices in the ground will transform this stone paved plaza into an interesting foggy field, while improving its micro climate in hot weather. The Event Plaza is relatively smaller in scale. 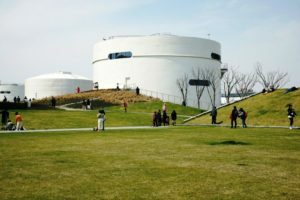 Its grassy surface will be ideal for hosting semi-public events and parties. To the east of the Event Plaza, a water pump house and a 25mx48m scale fire-fighting pool once stood there by the river. After renovation, they will be transformed into an individual Project Space for art events and small exhibitions. All images courtesy of OPEN Architecture.